Despite all the upheaval and effort involved, the move to Brewham Lodge Stables has been worth it alone, in terms of the team of enthusiastic local volunteers, who have been attracted to helping Ruth, Jemma and Abigail in their selfless care of all the horses. 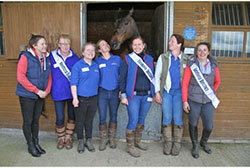 The response to Ruth’s call for volunteers to help in the yard at Brewham Lodge Stables has been fantastic. Here with Ruth Jemma and Abigail are Sam, Lorraine, Amie-Jo and Laura. They all chip in with all the stable duties: mucking out, sweeping, turning the horses out and grooming them. They were captured here posing in front of poster boy Wavertree Warrior by Jane Norman, photographer for Blackmore Vale magazine, who covered the opening of the Peter O’Sullevan High Dependency Unit by Jilly Cooper; Jane kindly gave us permission to use her photographs. 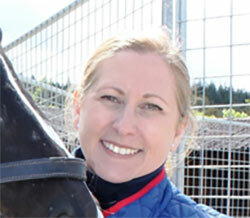 This is what Lorraine had to say, when asked why she had volunteered: "It gives me a great sense of purpose knowing that I'm helping these beautiful horses have a second chance in life, as well as making new friendships along the way." Meanwhile, Sam was of the view that a picture was worth a thousand words. Who could resist wanting to join this team? Whilst still on the subject of volunteers, Graham is looking to extend his network of Area Field Officers. Please click on our Do-it for Horseracing post to see full details. From the dream of a new recruit, through the loss of a Dream, to dream homes in Dorset and Staffordshire, and on to the dream antics of an old lag. 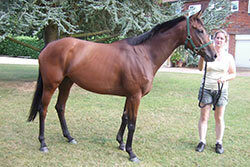 Here is new recruit Baddilini, a 7-year old bay gelding by Bertolini out of the Shirley Heights mare Baddi Heights. Not long out of Alan Bailey’s yard, after a flat racing career of over 50 races split between the turf and the all-weather, Baddilini was initially unsure of himself in his new surroundings. However, he is now settling down well and looking quite up to the challenge, dreaming of a new career. Here he is seen surveying the world from the Brewham lunge pen. Very sadly we have to report the loss of Wavertree Dream at the relatively young age of 16, to the effects of a Kissing Spine. Much loved by his racing connections and all who have since had anything to do with this lovely fellow, he will be much missed. The fact that our Dream was able to enjoy a cosseted late career as a companion horse underlines the value of the ethos of the Sanctuary. 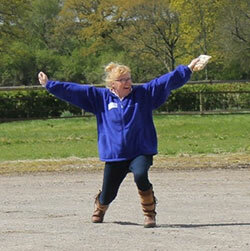 Striking a much more cheerful note was the news of the dream homes found by two of our horses. 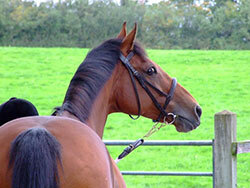 Lexi Grady Alice a mare by Royal Applause, or Little Lexi as she is known, has found the perfect home with Catriona in Dorset. 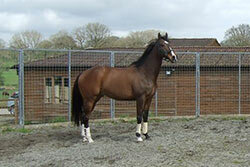 This lovely 5-year old mare has such a lot to offer in her own way and simply lives to please. Fingers crossed that she settles in well and thrives; we will keep you posted. Whilst here is 16- year old Sky Winner, one of a number of former brood mares rehabilitated at the Sanctuary, setting off on her trip to join Alex in her new dream home in Staffordshire as a companion horse. Spring may be in the air as far as 15-year old Wavertree Warrior is concerned, but our hearts are in our mouths, worrying if he is going to pull those clogs off again, whilst he dreams he is the racehorse of his youth, when he won or was placed 27 times in a 7-year flat career. 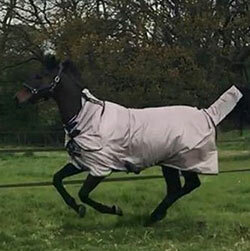 It is great to see Warrior enjoying life so much with his old frisk, after all the time and effort Graham and his dedicated team have put into sorting out his front feet, whilst he had to spend so much time in his stable. 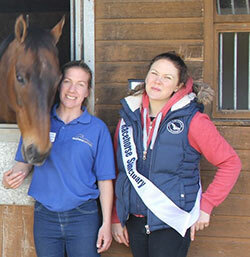 We have registered The Racehorse Sanctuary as a listed charity for UltraChallenge Series. We have supporters tackling two of these challenges to raise funds for us, but in an appeal to all those of you who want a test of your ability to get or remain fit, we would love more of you to take up a challenge. Full details of the UltraChallenge series can be found here. Why not emulate Selena, who is tackling the South Coast Challenge for us in memory of her much-loved thoroughbred mare Ellie. Selena is already well on the way to hitting the £1,500 target she has set with her JustGiving page and you can follow the story of her challenge preparations on her Facebook page. Or see what you can do to join, support or encourage David and Alison, representing Warrior’s Angels and tackling the Thames Path Challenge. 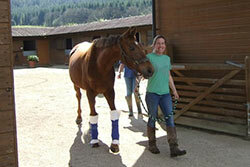 They too have made a solid start to raising funds for the horses through their JustGiving page. Looking forward, please check our 2017 Events Diary and put the key dates in your diaries, and those of your friends. We will again be holding our Autumn Charity Raceday at the Jockey Club’s iconic Sandown Park Racecourse on Wednesday 20 September 2017, sponsored by St James’s Place Wealth Management courtesy of Chartered Financial Planner Max Patel. Your planning committee aims to retain a formula, which has worked so well for us in the past: champagne reception, three course lunch in the panoramic Solario Suite, Grand Charity Auction, a full programme of racing and afternoon tea. PUT THIS EVENT IN YOUR DIARY NOW! The Thoroughbred Ball will be held this year on Saturday 9 December 2017 jointly in support of The Racehorse Sanctuary and the Peter O’Sullevan High Dependency Unit. The venue will be RAC’s prestigious Woodcote Park at Epsom. PUT THIS EVENT IN YOUR DIARY NOW!